side that is facing away from the axis (central line), such as the underside of a leaf. the indigenous or earliest known human population of a place or region. a small, dry, one-seeded fruit that does not open at maturity. radially symmetrical; capable of being divided into mirrored halves in several ways. gradually tapering to a sharp point (See image of Acuminate leaf tip). pointed; having a sharp tip (See image of Acute leaf tip). side that is facing away from the axis (center line), such as the upper surface of a leaf. fused or joined to a different type of structure or organ (e.g. stamens joined to petals). roots arising from the stem (See image of Adventitious roots). introduced and beginning to spread, but not yet established or fully naturalised; locally or temporarily naturalised. growing or existing above the ground or water surface (e.g. aerial roots). a dense cluster of small (usually fleshy) fruit that originate from a single flower, which appear as a single larger fruit (e.g. blackberry). occurring in, and/or naturalised in, a region to which it is not native. chemicals made by plants that have nitrogen in them, many of which possess potent pharmacological properties (e.g. cocaine, nicotine, caffeine, morphine, atropine). inhibition of growth in one plant that is caused by chemicals produced by another plant. unconsolidated soil, or other inorganic or organic materials (e.g. silt, sand, clay, gravel), deposited on land by running water. mountainous regions; growing on mountains above the timberline. arranged singly at each node, particularly leaves or buds on different sides of a stem. having male (i.e. staminate) and bisexual flowers on the same plant. a plant which completes its life cycle within one year and then dies after flowering. the part of the stamen which bears the pollen in a flower. the period of flowering during which pollen is produced and shed. directed or bent forwards or upwards. the point of culmination (i.e. the tip or end of a structure); the highest point. ending abruptly in a small, sharp and narrow point. reproduction without fertilisation; asexual production of seeds. a structure that is joined to a larger body (e.g. awn, bristle, etc.). lying flat or pressed closely to a surface but not joined to it. living or growing in, near, or on water. curved into a shape that forms or resembles an arch; bow-shaped. a small light to dark coloured bump found on the stems of cacti, out of which grow clusters of spines; the distinctive identifying feature of plants in the cactus family (i.e. Cactaceae), which separates them from other succulent plants. a small fleshy appendage that is attached to a seed, and may partially or entirely envelope a seed, which arises from or near the hilum. having sharp structures for defence (e.g. spines, thorns, prickles, etc.). a member of the arum family (i.e. Araceae). having a distinctive smell or aroma. having segments that are held together by joints; jointed. growing on a slant at first, but becoming upright (See the Upright (Erect or Ascending) information page). reproduction that occurs without sexual organs (e.g. vegetative reproduction or production of seeds by apomixis). not symmetrical; cannot be superimposed on its mirror image. gradually narrowing to a slender point. abbreviation of the Latin term auctorum non; used to indicate that the associated scientific name was misapplied or wrongly applied. an ear-like projection; a small projection at the base of a leaf blade. (adj.) having one or more auricles. 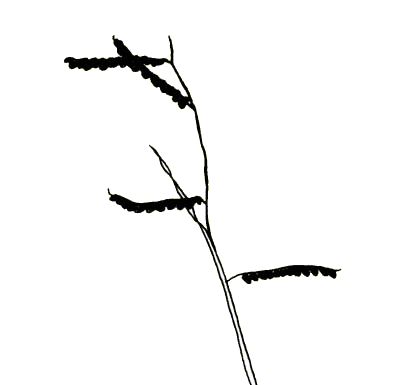 a slender bristle-like structure that is usually rigid in nature. having one or more awns. the upper angle between a leaf stalk and the stem that bears it. (adj.) located or occurring in an axil. a short and sharp point projecting in reverse. located at or near the base of a particular plant part. 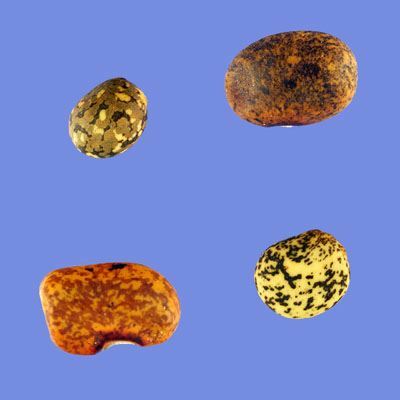 a pointed projection or tapering tip present on some seeds and fruits. a fleshy fruit, without a hard centre, that does not open at maturity (See the berry information page). a plant which lives for longer that one year but less than two years. two-lipped; usually used to describe the fused corolla or calyx of a flower with two 'lips' at its apex, usually with one referred to as the upper lip and the other referred to as the lower lip. having two sides that are the mirror image of each other. a small fruit with a spine or prickle. the number and variety of organisms found at a site or within a specified geographic region. the use of natural enemies to reduce the damage caused by a weed or other pest population. the weight or mass of living matter within a given area; the mass per unit area of living plant material. an area that has a characteristic flora, fauna, and environmental conditions that is bounded by natural rather than man-made borders. twice divided; consisting of parts that are already compound. cut into lobes, each of which are divided into smaller lobes. 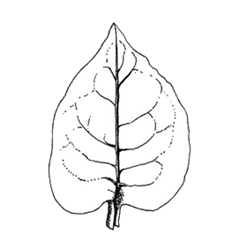 describing a leaf deeply cut into lobes, each of which are deeply divided into smaller lobes, that are cut almost to the midrib. having both male and female parts in the one flower. 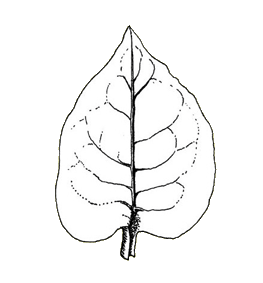 a leaf with leaflets arranged in three sets of three (See the Bi-ternate Leaves information page). the expanded, usually flattened, part of a leaf or other plant structure. a whitish or bluish coating on the surface of certain plant parts that is waxy or powdery in nature. a flower spike that is initially coiled, with the flowers being arranged only along one side of the rachis, and which proceeds to uncurl as it matures; the typical flower cluster or inflorescence type of the Boraginaceae plant family. slightly salty water; saltier than fresh water, but not as salty as sea water. a small leaf-like structure usually found underlying another plant structure (e.g. flower). a small or secondary bract. 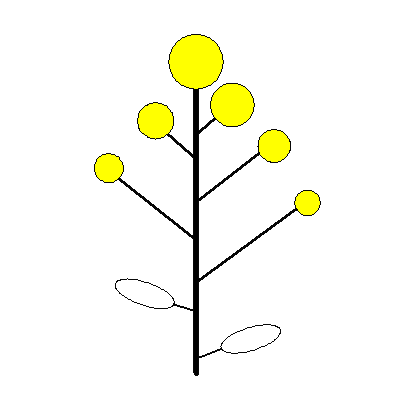 a very small or very young branch; the smallest subdivision of a branch. refers to a member of the group of plants known as the dicotyledons (one of the two groups of flowering plants, the other group being the monocotyledons); having broad or relatively broad leaves rather than thin or needle-like leaves. a plant storage structure found below ground, which is usually surrounded and protected by dead leaf tissues. a small bulb that may be produced below ground, in the leaf axils, or in the seed-head (sometimes replacing the flowers). a small bulb; a bulbil. bulb-like; producing bulbs or growing from a bulb (i.e. also called bulbiferous). a structure consisting of the seeds or fruits of plants, usually surrounded by a prickly outer covering. a flared outgrowth at the base of a tree that provides support. (adj.) having buttresses; supported by buttresses. dropping off quickly; being shed at an early stage of development. a soil containing a high proportion of calcium carbonate that is usually derived from chalk or limestone; a relatively alkaline soil. the hardened, and sometimes sharp, base of a grass flower spikelet, and later fruit. 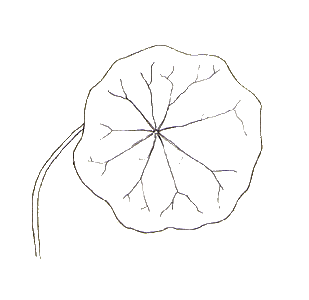 the outer, and usually leaf-like, whorl of a flower that is made up of the sepals. bell-shaped; shaped like a bell. densely clustered together in a head; resembling a capitulum; globular. a flower-head; an inflorescence of densely packed small flowers (i.e. florets) that is mostly found in the daisy plant family (i.e. Asteraceae). a dry fruit that opens at maturity, releasing its contents. the structural unit of a pistil, that is derived from a modified, ovule-bearing leaf. the small, dry, one-seeded fruit of a grass. an elongated cluster of unisexual flowers that lack petals. attached to a stem along its length (i.e. not part of a basal rosette). describing the sap, or a plant containing sap, that is capable of damaging, burning, or eating away tissues. 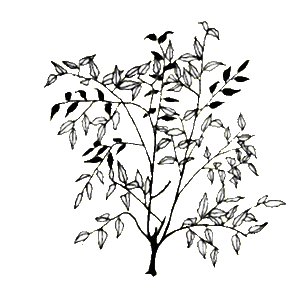 a plant of the goosefoot plant family (i.e. Chenopodiaceae). (pl.) small hairs that are usually found along the margin of a plant structure. bordered with a line of small hairs; having cilia. rolled up into a coiled ring. opening along the circumference, with the top coming off like a lid. 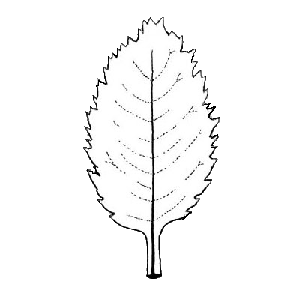 a flattened stem which resembles, and functions as, a leaf. club-shaped; gradually widening towards the tip. a stem-seed; a seed that is produced at the joints and/or in the leaf sheath bases of flowering stems. a vine or climbing plant that grows up over a supporting structure or other plants (See the Climbing or Twining information page). creeping upward by twining about a support, or by attaching itself to a supporting surface or plant. shaped like a snail shell. column-shaped; shaped like a column. 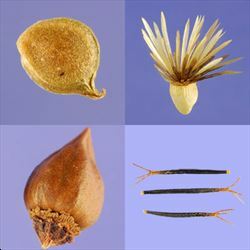 a tuft or cluster of hairs on the top of a seed. a leaf composed of more than one part or leaflet. a compound flower cluster in which several smaller flower clusters (i.e. umbels) arise from the same point at the top of a flowering stem (i.e. peduncle). folded together lengthwise, with the upper surface usually on the inside. the reproductive structure of certain non-flowering plants (e.g. pine trees), consisting of a central axis around which are arranged a compact group of scales. cone-shaped; having a shape that tapers from a wide base to a point at the apex. a gymnosperm that bears its reproductive structures in cones; a member of the plant division Pinophyta. used to describe plant parts or organs of the same type that are closely joined or fused to each other. rolled or coiled lengthwise, in an upwards direction; with edges rolled upwards. forming shoots or sprouts from a stump; a thicket of bushes or small trees. having a leathery texture; thick, tough, and somewhat rigid. describes woody stems at least partially made up of a light, soft, water-resistant protective tissue (i.e. cork). an underground storage and propagative structure similar to a bulb, but formed from a swollen underground stem. a small bulb-like propagative structure that is produced in the leaf forks (i.e. axils); a small and/or young corm. a collective name for the petals; the inner and usually colourful whorl of a flower. a crown-shaped outgrowth of the perianth of a flower; any crown-like structure at the top of a plant part. shaped into folds; with parallel and alternating ridges and grooves. an inflorescence where the flower stalks (i.e. pedicels) branch at different points on the stem, but the flowers are all borne at roughly the same height. having corymbs; resembling a corymb. widely distributed; occurring in many parts of the world or in many habitats. the first leaf, or one of the first pair of leaves, of a seedling; a seed leaf. a plant with a low-growing or creeping habit. to grow or spread over the ground surface or over other ground-dwelling plants (See the Creeping (Prostrate or Decumbent) information page). having a margin with blunt or rounded teeth (i.e. small scalloped projections). slightly or finely crenate; having a margin with small blunt or rounded teeth (i.e. tiny scalloped projections). crinkled, tightly curled or finely wavy. the long-lived part of a plant, usually at ground level or mostly underground, from which the stems and roots are produced; the part of a plant where the stems and roots merge; a corona. describing a seedling that has seed leaves (i.e. cotyledons) which remain hidden within the seed-coat. the upright stem of a grass or similar plant; the flowering stem of a grass plant. a form of a plant species that has been developed or selected intentionally and maintained under cultivation. wedge-shaped; triangular, but narrower at the base and wider at the tip. an inflorescence consisting of a cuplike structure enclosing a female flower and several male flowers that is only found in some members of the spurge plant family (i.e. Euphorbiaceae) (See the Cyathium information page). 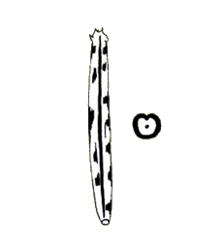 cylinder-shaped; elongated and round in cross-section. a flat-topped or convex flower cluster in which the uppermost flowers open first. a one-seeded indehiscent fruit that is characteristic of plants in the daisy plant family (i.e. Asteraceae); a type of achene with the calyx adhering to it. describing a plant that sheds most or all of its leaves at the end of the growing season. a plant officially legislated against by a government authority due to its pest potential. growing or lying on the ground but with upright tips (See the Creeping (Prostrate or Decumbent) information page). a leaf with its base extending down the stem and forming narrow wings. arranged along the stem in pairs (i.e. oppositely arranged), with each pair at right angles to the pair below. bent backwards and downwards at a sharp angle. a fruit that opens at maturity, in order to release its seeds. with small tooth-like projections, generally pointing outwards. 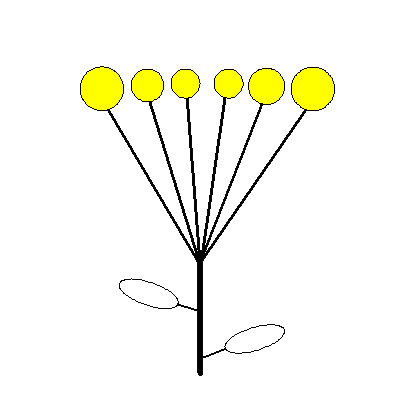 describing stamens in which the filaments are fused into two, usually unequal, groups. the dispersal unit of a plant; a reproductive plant part (e.g. seed, fruit, or spore) that is modified for dispersal. 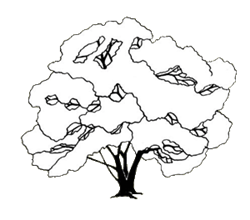 the type of branching that results when a stem divides into two branches, each of which divide again in a similar manner after a period of growth, and so on. a flowering plant with two seed leaves or cotyledons that usually appear at germination. having distinct parts or finger-like projections branching from a common point; a type of inflorescence with several racemes branching or radiating from the same point (See the Digitate or Sub-digitate Inflorescence information page). having two distinctly different shapes or forms. having separate male and female (i.e. unisexual) flowers that are borne on separate plants. to separate at the joints. disc-shaped; having a somewhat flattened and circular shape. where the two surfaces of a leaf are different in colour. deeply divided into many segments or lobes. spreading apart in different directions. 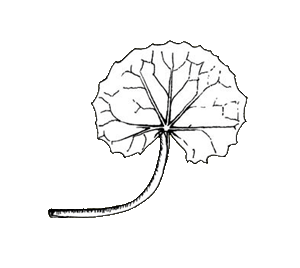 a small, rounded projection that is often located on or near the midrib of a leaf (See an image of a domatium). flattened in such a way that the flower parts are not folded on themselves. a fruit with a stony centre (which contains a single seed) surrounded by a fleshy layer and a skin that does not open at maturity. a small drupe; a segment of an aggregate fruit (e.g. blackberry). without any small hairs; lacking cilia. shaped like an oval or ellipse, and solid or three-dimensional. shaped like an oval or ellipse. being significantly longer than wide (i.e. slender). with a broad shallow notch at the tip. native to a particular locality, region, state or country. 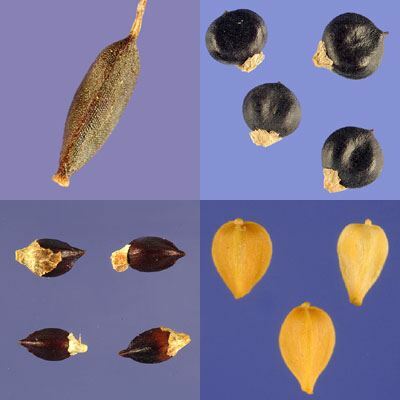 tissue within seeds of flowering plants that surrounds the embryo and contains food reserves. sword-shaped; shaped like a sword blade. 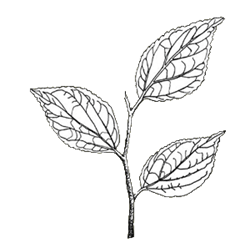 a leaf margin that is uniform (i.e. without indentations, lobes or divisions) (See the Entire Leaf Margin information page). a naturalised plant species which displaces native species, or adversely affects the survival or regeneration of native species, in natural or somewhat natural vegetation communities (i.e. not in agricultural areas, gardens, highly disturbed areas, etc. ); a plant that is recognised as a weed in native vegetation or native plant communities. lasting for only a short period of time. a group of sepal-like bracts situated just below the true sepals or calyx. a plant which grows on another plant, but does not obtain nourishment from it. having a vertical or upright position. having leaves throughout the year; not deciduous. not native; from another part of the world (i.e. foreign). a taxonomic group of related plants, below an order and above a genus, consisting of species exhibiting similar characteristics; a taxonomic group of related plant genera. a dense bundle or cluster. a plant that does not flower or produce seeds, is made up of roots, stems, and fronds and reproduces by spores. 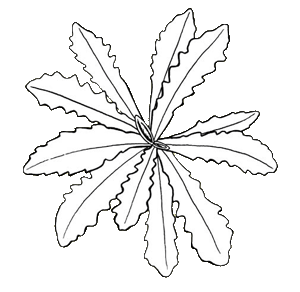 diagram of an example fern. with a covering of rusty-coloured hairs; rust-coloured or reddish-brown. the physical union of male and female gametes (i.e. a pollen grain and an ovule). roots that are small, thin, bunched, and resemble a group of fibres. the stalk of a stamen which bears the anther at its tip. thread-like; resembling a filament or thread; very slender. fringed; having a fringe of small slender appendages. the leaf immediately below the seed-head of a grass plant. winding or wavy in nature; somewhat zig-zagged. a small flower that is part of a larger cluster; a reduced grass flower. another name for a head or capitulum; an inflorescence of densely packed small flowers (i.e. florets) that is mostly found to the daisy plant family (i.e. Asteraceae) (See the Head (Capitulum) information page). foul-smelling; having an offensive odour. a dry fruit which has one compartment and opens only along one side at maturity. the compound leaf of a fern. shaped like a funnel; funnel-shaped. scrubland vegetation characteristic of the western Cape area in South Africa. having a viscous consistency; resembling jelly. bent like a knee; having knee-like joints that are bent at a considerable angle. a taxonomic grouping below a family and above a species, consisting of species exhibiting similar characteristics. The genus and species name together also make up the scientific name. almost glabrous or almost hairless; sub-glabrous. becoming glabrous or hairless with age; almost glabrous or almost hairless. hairless; without hairs or similar structures. a structure that is usually minute and globular which often secretes oily, resinous or gummy substances. having glands; associated with a gland or glands. having a pale bluish-green or greyish coloration. rounded; shaped like a sphere, ball or globe. barbed hairs or bristles (often present in the areoles on cacti stems). a small leaf-like structure (i.e. bract) below or enclosing a flower, or a flower spikelet in the grasses and sedges. a grass-like plant; resembling a grass or concerning a grass (See the Grass-like (Graminoid) information page). grain-eating; feeding on grain and seeds. containing or being composed of granules; having a grainy texture. 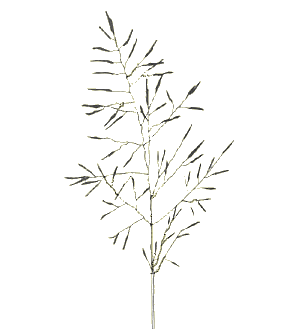 a plant having simple and generally elongated leaves, a jointed stem, an inflorescence of flower spikelets, and producing fruit with a single seed (i.e. caryopsis); a member of the Poaceae plant family. 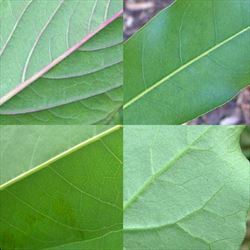 a number of individual leaves gathered or bundled together (for the purposes of this publication it specifically applies to several leaves arising from the same point at the tip of a small branch, and is distinct from a whorl of leaves in that the leaves are not arranged around the stem (See the Leaves Grouped information page). a seed-producing plant, but one in which the seeds are held naked and not produced by a flower or in an ovary (e.g. a cycad or conifer). having separate female (i.e. pistillate) and bisexual flowers on separate plants. the general appearance and form of a plant. a location where, or environment in which, an organism commonly grows. a tree that has one type of bark at its base (usually rough) and another type of bark on its upper parts (usually smooth). referring to the base of a leaf that has two somewhat triangular lobes; arrowhead-shaped. 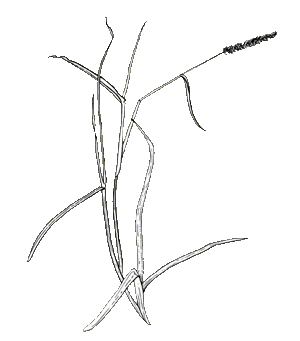 a specialised root-like sucker, that is produced by parasitic plants (e.g. dodder), which penetrates another plant (i.e. a host) and obtains water and nutrients from it. a flower-head; an inflorescence of densely packed small flowers (i.e. florets) that is mostly found in the daisy plant family (i.e. Asteraceae) (See the Head (Capitulum) information page). a non-woody, usually small, seed-bearing plant (See the Herbs or Others information page). see herb; resembling a herb. a scar on a seed that indicates its previous point of attachment to a fruit. covered with long and coarse or stiff hairs; hairy. 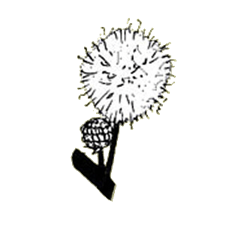 covered in short stiff hairs, rough hairs or bristles. covered with minute hairs that give the surface a greyish appearance; having a greyish or whitish appearance. curved or barbed plant parts that aid in attachment to supporting structures or in seed dispersal. an organism on which another organism lives. a plant produced by the crossbreeding of two distinct species. readily absorbing moisture, particularly from the atmosphere; absorbing and releasing moisture, depending on the amount of moisture in the atmosphere, and thereby causing twisting or untwisting to occur. 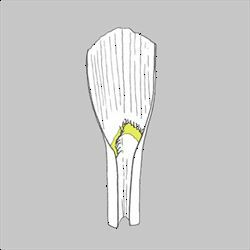 a cup-shaped or tubular extension of the flower stalk on which the sepals, petals, and stamens of certain flowers are borne. overlapping; arranged with overlapping edges. a fruit that has not yet reached the stage of full development; not ripe. a pinnate leaf with an odd number of leaflets (i.e. with a single terminal leaflet). deeply and sharply cut or notched, usually referring to the margin of a leaf. a fruit that does not open at maturity, in order to release its seeds. native; originating or occurring naturally in a region or environment; not introduced. a membrane that encloses and protects developing spores in the reproductive structures (i.e. sorus) of a fern. a term that describes the arrangement of flowers as a group or cluster on the flowering part of a plant; the seed-head. a term that describes the arrangement of fruit as a group or cluster; the fruiting stage of an inflorescence. a gland that is located on the extension of the leaf stalk (i.e. rachis), but not at the junction of a pair of branchlets (i.e. pinnae) in a twice compound (i.e. bipinnate) leaf. the part of the stem between two nodes or joints. a plant that has been brought to a new place or environment and become established there. (adj.) belonging to, or about, an involucre. a structure consisting of a number of prominent bracts that encircle the base of a flower, flower spikelet, flower cluster, spikelet cluster or fruit. a gland that is located on the extension of the leaf stalk (i.e. 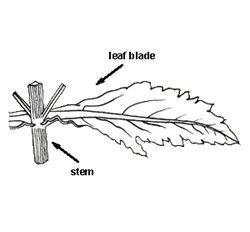 rachis) at the junction of a pair of branchlets (i.e. pinnae) in a twice compound (i.e. bipinnate) leaf. not fully grown or developed; immature. a flower part that is found only in those plants with pea-shaped flowers (i.e. Fabaceae), consisting of the two lowest petals, which are partially fused together and resemble the 'keel' of a boat; a prominent ridge running lengthwise on a plant structure. having a prominent ridge running lengthwise; keel-shaped. having deeply and irregularly cut edges. deeply cut into narrow pointed teeth or lobes; having a fringed margin or border. the expanded, usually flattened, part of a leaf (i.e. 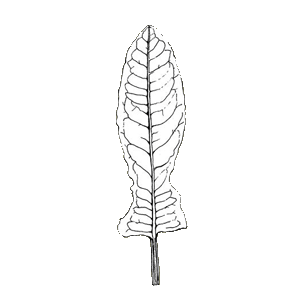 the leaf blade). lance-shaped, narrow and tapering to a point at the apex. situated at or relating to the side, or along the sides, of a plant part. flattened in such a way that the flower parts are folded on themselves. a milky sap or juice that is exuded from plant parts when they are broken. a form of vegetative reproduction where a piece of stem, that is still attached to a parent plant, becomes covered with soil and develops roots; the process of rooting in branches, twigs, or stems that are still attached to a parent plant. part of a larger compound leaf that itself resembles a small leaf. a member of the pea plant family (i.e. Fabaceae); the fruit of members of the pea plant family (i.e. a pod). 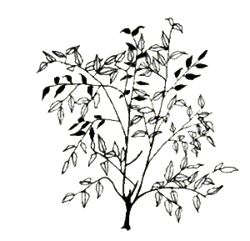 a plant, or resembling a plant, of the pea plant family (i.e. Fabaceae); producing legumes or resembling a legume. 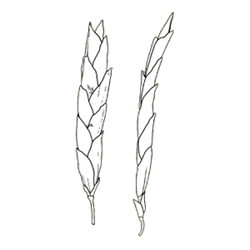 the lower and outermost of the two scales that are part of a grass floret and enclose a grass seed. a corky spot or pore on the stem or branch of a woody plant. lens-shaped; shaped like a biconvex lens. a small structure (usually membranous or ciliate) at the junction of the leaf sheath and leaf blade in the grasses (also present in some sedges). a coastal region or habitat, near the sea. having deeply indented margins and forming sections that are not completely separated from one another. running lengthwise or in the direction of the length. lyre-shaped; a pinnate leaf where the terminal leaflet is significantly larger than the other leaflets; a pinnatisect leaf where the terminal lobe is significantly larger than the other lobes. covered with a course white, powder-like substance. thin and translucent; resembling a membrane. a dry single-seeded fruit that is derived from a carpel and splits off from the remains of the ovary at maturity. the central and principle vein of a leaf; the midvein. cylindrical but constricted at regular intervals; resembling a string of pearls. any of the large group of flowering plants having a single cotyledon in the seed (e.g. grasses, sedges, orchids, and lilies). a population made up of a single species; a site or area totally dominated by a species to the exclusion of any other species. having separate male (i.e. staminate) and female (i.e. pistillate) flowers, but with both flower types present on the same plant (e.g. corn). growing in or from mountain areas. having different coloured spots or blotches; variegated. ending abruptly in a small sharp point; ending in a mucro. establishing or persisting in a new environment or location after being introduced from another region (i.e. not native). 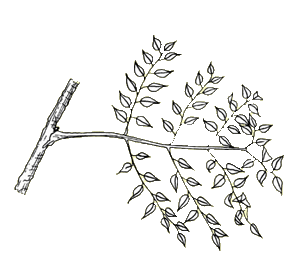 the joint on a stem from which other structures such as leaves arise. a weed that is harmful in some way; also a term describing a plant officially legislated against by a government authority due to its pest potential (i.e. another name for a 'declared plant'). 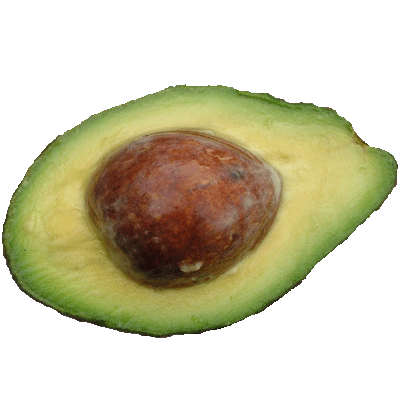 a one-seeded and hard-shelled fruit that does not open at maturity. heart-shaped in outline (i.e. cordate), but with the pointed end at the base. lance-shaped (i.e. lanceolate), but with the pointed end at the base. somewhat elongated (i.e. 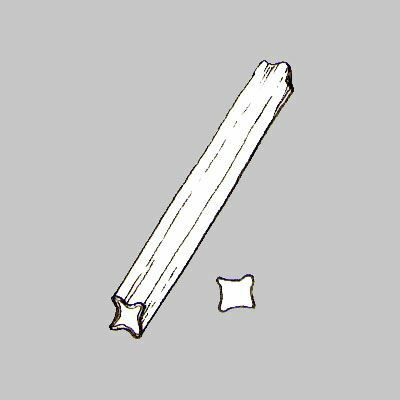 longer than broad) and with approximately parallel sides, but solid or three-dimensional; oblong in shape but solid or three-dimensional. somewhat elongated (i.e. longer than broad) and with approximately parallel sides, but flattened or two-dimensional. egg-shaped in outline (i.e. ovate), but with the narrower end at the base. egg-shaped and solid (i.e. ovoid), but with the narrower end at the base. triangular in shape, but with the pointed end at the base. with a blunt or rounded tip (i.e. apex). a sheath-like structure encircling the stem near the base of a leaf. a lid covering the top of a flower bud. arranged in pairs and arising from the same level along a plant stem (See the Leaves Oppositely Arranged information page). circular in shape (See the Round (Orbicular) information page). 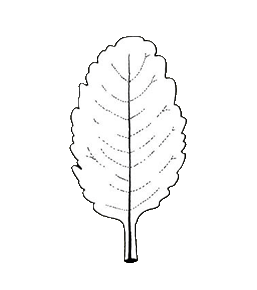 diagram example of an obicular shaped leaf. the place where the weed came from (most weeds are introduced plants and originate from other countries, but have become naturalised here in Australia). a plant deliberately grown or cultivated for its beauty or decorative value. the female part of a flower which contains the immature seeds (i.e. ovules) and later becomes the fruit. egg-shaped and flat; broader and rounded at the base and tapering toward the end. egg-shaped and solid or three-dimensional. an immature seed prior to fertilisation. 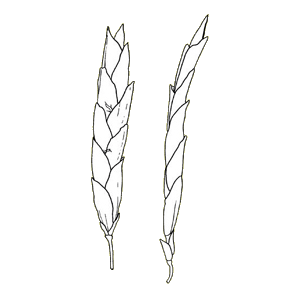 the upper and innermost of the two scales that are part of a grass floret and enclose a grass seed. a compound leaf divided into leaflets that radiate from one point and resemble the fingers of a hand; the arrangement of lobes, segments or veins on a leaf where they radiate from one point like the fingers on the palm of a hand. palmately divided about half-way to the base. palmately divided almost to the base. an inflorescence or flower cluster that is divided into branches, each bearing several flowers. having flowers in a panicle; resembling a panicle. widely distributed throughout the tropical regions of the world. short, rounded, bumps or projections. a ring of hairs, bristles or scales found at the top of many fruit belonging to the daisy plant family (i.e. Asteraceae). an organism that grows, feeds and is sheltered on or in another organism known as its host (i.e. causing harm but providing no benefit to its host). once-compound (i.e. pinnate) but with an even number of leaflets (i.e. all the leaflets are arranged in pairs and there is not a single terminal leaflet). the stalk of each flower that is part of a larger inflorescence or flower cluster. having a pedicel or flower stalk. the stem or stalk that supports a solitary flower; or the main stalk that supports an inflorescence or flower cluster. 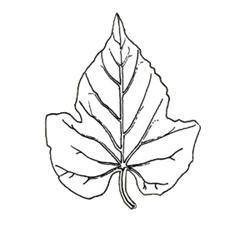 having the leaf stalk attached to the underside of the leaf blade instead of at its base or margin. having a tuft of short hairs at the end; resembling a paintbrush. a plant which requires more than two years to complete its life cycle; living for longer than two years. having one or more holes or perforations. a collective term describing the petals and sepals or their equivalent. the part of a flower that is usually brightly coloured and forming the inner whorl of the perianth. petal-like; resembling a petal; a flower structure that resembles a petal but is derived from other flower parts (e.g. sepals or stamens). having a petiole or leaf stalk. 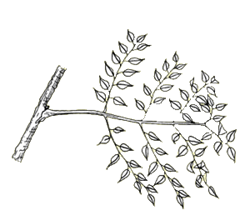 a leaf stalk; a stalk attaching the leaf blade to the stem. the stalk of a leaflet in a compound leaf. a flattened and expanded leaf stalk that takes on the appearance and function of a leaf blade; a leaf-like petiole. with a scattered covering of long soft hairs. one of the branchlets of a twice-compound (i.e. bipinnate) leaf on which the leaflets are borne; one of the leaflets of a once-compound (i.e. pinnate) leaf. a once-compound leaf having several leaflets arranged on each side of a stem or rachis. having the leaflets growing opposite each other in pairs on either side of the stem. 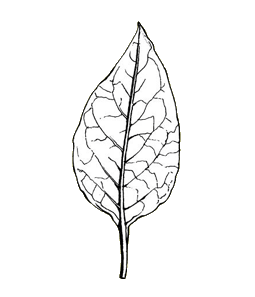 a simple leaf with its blade cut into lobes reaching about halfway to the midrib so that it partially resembles a pinnate leaf. a simple leaf with its blade deeply cut into lobes reaching almost to the midrib so that it closely resembles a pinnate leaf. one of the leaflets of a twice-compound (i.e. bipinnate) leaf. the female organs of a flower, usually consisting of an ovary, style(s) and stigma(s). a female flower; a flower bearing pistils, but having no male parts. a soft, spongy substance found in the central portion of some stems. (adj.) having or resembling pith. a small plant, often formed on the tips of leaves or creeping stems (i.e. stolons). feathery; resembling a plume; with hairs or fine bristles on both sides. 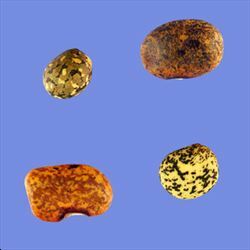 a several-seeded dry fruit that splits open at maturity; the fruit of a leguminous plant; the fruit of a member of the pea plant family (i.e. Fabaceae). a powdery substance, consisting of male gametes, that is borne on the anthers of a male (i.e. staminate) or bisexual flower; the fertilising agent for immature seeds (i.e. ovules). a fruit having several seed chambers that are surrounded in a fleshy outer part that is largely derived from the expanded receptacle (e.g. an apple). 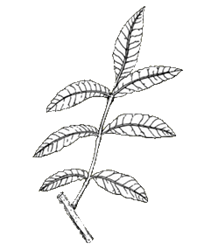 a small sharp outgrowth on the stem or leaf; a small thorn. spreading or trailing along the ground but not rooting at the nodes; prostrate. 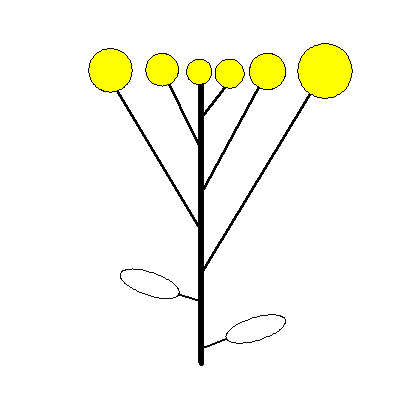 a structure that gives rise to a new plant (e.g. seed, spore, etc.). growing or lying flat along the ground. having a surface covered with a bluish or greyish coloured wax-like or powdery coating; with a powdery or waxy bloom; having a frosty appearance. a false leaf stalk; resembling a petiole, but actually derived from another structure (e.g. the narrowed base of the leaf blade). a false stipule; resembling a stipule, but actually derived from another structure (e.g. an under-developed leaf). appearing to be whorled, but not actually so. 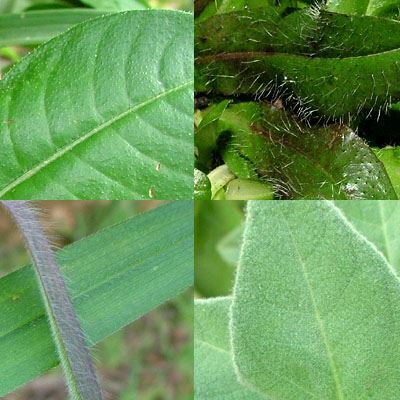 covered with very short, fine, hairs; sparsely hairy. covered with short, fine hairs; hairy. a swollen section at the base of a leaf stalk (i.e. petiole) or leaflet stalk (i.e. petiolule). spotted; covering with coloured dots or glands. sharply-pointed; having a hard and sharp point; having a strong unpleasant odour. the hard centre of a drupe or drupelet. having four angles or four sides in cross-section; four-sided. an unbranched inflorescence with several flowers, each flower having a stalk or pedicel. having flowers in racemes; resembling a raceme. the main stem of a branched inflorescence (i.e. flower cluster); the main stem of a compound leaf. capable of being divided into mirrored halves in several ways (i.e. actinomorphic). arising from or near the roots (e.g. 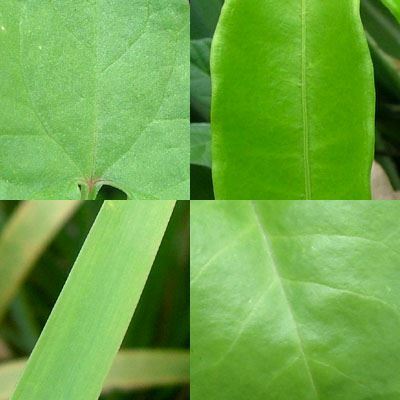 basal leaves are sometimes called radical leaves). a plant that is vegetatively produced off of a larger parent plant, and is a clone of that plant. the strap-like or petal-like corolla of a ray floret; a ray floret. 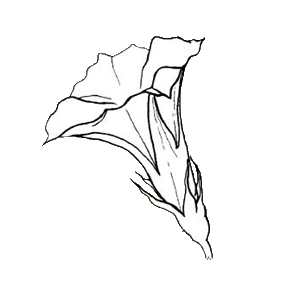 a floret that has a strap-like corolla and resembles a petal. an expanded structure at the tip of the flower stalk on which all of the parts of a flower are borne. curved in the opposite direction; curved downwards or backwards. marked with a network of lines; with the pattern of a network; net-like. directed or bent backwards or downwards. having a rounded, but shallowly notched or slightly indented, tip or apex. rolled or coiled lengthwise, in a downwards direction; with edges rolled under. consisting of or having the appearance of rhizomes. a horizontal, root-like stem usually found underground and often with short internodes. diamond-shaped; shaped like a rhombus. having ridges or raised features on the surface. example diagram of a ribbed stem. relating to or located on the banks of a river or stream; growing or located near waterways. a small or fine root. a circular arrangement of leaves that radiate from a central point close to the ground. arranged into a rosette (See the Leaves forming a Rosette (Rosulate) information page). having a rough and wrinkled appearance or texture. saw-toothed with the teeth pointing backwards (see an image of a runcinate leaf). a creeping or trailing stem that roots at the nodes and at intervals along its length forms new plants; a stolon. having the shape of an inflated pouch or sac; pouch-like; possessing an inflated pouch or sac. arrow-head shaped; triangular with the two sharp, downwards-pointing, lobes at the base. a winged fruit that is dry, indehiscent, and usually one-seeded. an ecological community made up of grassland with scattered trees that is found in tropical and sub-tropical regions. having a slightly rough surface texture; slightly scabrous. roughly hairy; covered with rough hairs. having a rough surface texture. a much-reduced leaf or a small leaf-like structure; a small, thin, and often disc-shaped structure (e.g. a specialized leaf or bract) that protects a flower bud or is present on a fruit. edged with a series of curved projections; crenate. climbing; having a tendency to climb. a leafless flower stalk or peduncle that arises from near or below the ground. thin and membranous in nature, but also dry and not green in colour. a dry indehiscent fruit that splits into one-seeded segments (i.e. mericarps) at maturity. a universally used name written in Latin and made up of two parts - the genus name and the species name. a forest in a relatively dry area that is dominated by woody plants with thick, leathery, evergreen leaves that retain water. a plant that grows over low obstacles, structures or other low-growing plants; a plant that climbs almost horizontally. growing over low obstacles, structures or low-growing plants; climbing almost horizontally. 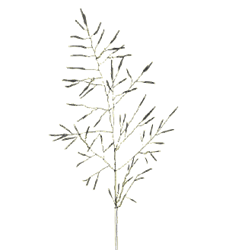 a grass-like plant belonging to the family Cyperaceae, particularly the genus Cyperus; a plant which has clusters of inconspicuous flowers subtended by bracts, elongated and hairless leaves, usually has triangular stems, and is often found growing in marshy areas. a propagative plant part, or propagule, produced in a flower; a ripened plant ovule, usually consisting of an embryo and endosperm covered with a seed coat, and often also with accessory structures. having relatively low rainfall, but not completely arid; somewhat arid. partially deciduous; describing a plant that sheds some of its leaves at the end of the growing season. a part of the calyx, or outer whorl of a flower, that is often green and leaf-like in appearance. sepal-like; resembling a sepal in colour and shape, but derived from other plant parts (e.g. used to describe petals that resemble sepals). divided into partitions; having one or more septa. a thin partition or wall that separates two cavities, especially one that separates the compartments of an ovary or fruit. edged with sharp projections or teeth that are forward-pointing (See the Sharply Toothed (Serrate) information page). having a minutely serrate margin; finely, but sharply, toothed. 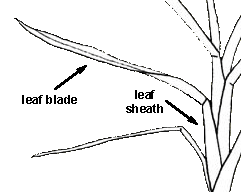 stalkless; without a stalk and attached directly at the base. a stiff hair or bristle. covered with bristles; having setae. an almost tubular structure such as the base of a leaf that surrounds or clasps the stem. covered with or having a sheath. a many-stemmed, woody, perennial plant of relatively low height; a bush (See the Shrub information page). a dry fruit that splits open from both sides at maturity and is either very elongated or obviously two-celled; the fruit of the mustard plant family (i.e. Brassicaceae). with a strongly or deeply wavy margin; with a wavy and indented or somewhat lobed margin. a reproductive structure found on the underside of a fern frond consisting of a cluster of spore-producing structures (i.e. sporangia). a type of flower spike (i.e. inflorescence) consisting of small flowers crowded on a thickened stem (common in the arum plant family (i.e. Araceae) and is usually subtended by a spathe). a large and often colourful bract that subtends, and often partially encloses, a flower cluster (i.e. inflorescence). 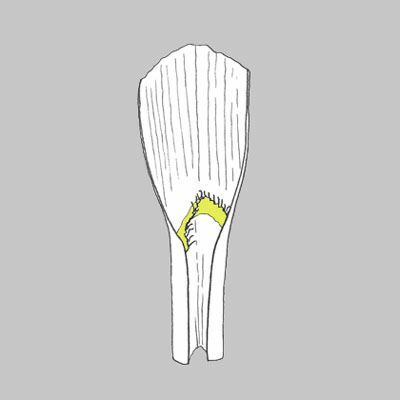 a small spathe that subtends and encloses only part of an inflorescence (mainly found in the grass plant family (i.e. Poaceae)). spoon-shaped; with a long, narrow, base and a rounded tip. a category of taxonomic classification ranking below a genus and consisting of individual organisms grouped together because of their common attributes and with the ability to interbreed. an individual of a species; a representative sample. an unbranched inflorescence with stalkless (i.e. sessile) flowers arranged directly on the stem. a unit of the inflorescence in the grasses and sedges having one to many reduced flowers (i.e. florets); a small flower spike. a strong and thin woody outgrowth with a sharp point. small structures in which spores are produced; spore cases. 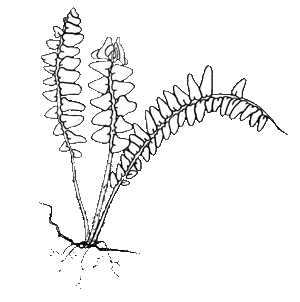 a reproductive body found in the ferns and certain other non-flowering plants. a specialised structure produced on modified leaf branches of some aquatic ferns that contains reproductive organs (i.e. spores or sporangia). growing or spreading in different directions in a straggling or disorderly manner. a male reproductive organ of a flower consisting of a pollen-bearing anther and its stalk (i.e. filament). a male flower; a flower bearing stamens but having no female parts. a reduced or partially-formed stamen; a modified stamen that is sterile. the uppermost and usually largest petal of a pea-shaped flower; the uppermost and usually largest petal or flower of the pea plant family (i.e. Fabaceae). star-shaped; having several pointed projections radiating from a central point. incapable of producing seed, fruit or other reproductive propagules. the part of a female flower which is receptive to pollen, and is usually located at the top of a style (See an image of a stigma). part of or relating to a stigma. a stalk that supports a structure; the stalk supporting an ovary; the stalk of a fern frond. relating to a stipule or stipules. a small and usually leafy structure or appendage at the base of a leaf that is usually one of a pair. a creeping or trailing stem that grows above ground and roots at the nodes; a runner. growing or spreading irregularly in different directions in a sprawling manner. marked with long and narrow stripes, ridges or grooves. the usually elongated and slender female part of a flower connecting the ovary to the stigma (See an image of a style). almost alpine; of or growing just below the alpine zone. almost digitate; a type of inflorescence with several racemes radiating or branching from almost the same point. almost disc-shaped; nearly discoid in shape. almost elliptic; somewhat oval in shape. almost equal, particularly in size. almost hairless; nearly glabrous; glabrate. almost globular; somewhat globe-shaped; nearly spherical. growing under the water surface; below the water surface; under water. almost moniliform; somewhat resembling a string of pearls. almost oppositely arranged; almost paired. almost orbicular; almost circular in shape. a small or low-growing shrub. a taxonomic subdivision of a species. underground or below the soil surface; situated within the earth. almost tropical; in Australia the climatic region just south of the Tropic of Capricorn. the condition of being succulent. describing a leaf or stem that is thick and fleshy or juicy in appearance and has a water-storing capacity (See an image of succulent leaves); a plant with juicy leaves or stems that is adapted to arid conditions. a shoot produced from below ground (i.e. from the roots or base of the stem) that can give rise to a new plant (i.e. a form of vegetative reproduction). can be superimposed on its mirror image; exhibiting symmetry. an alternative, usually previously used, scientific name. A synonym results when it is determined that a species was originally wrongly identified or placed in the wrong genus, and it is therefore given a new name to replace the incorrect one. A species can have several synonyms if its taxonomy has been difficult to define in the past. the main root of a plant which grows directly downward to a considerable depth. a taxonomic category (e.g. species, genus, family, etc.). relating to taxonomy or classification of organisms. the theory and practice of classifying organisms in an ordered system. a climate that is mild (i.e. warm in summer and cool in winter); the geographic area between the tropics and the frigid zones. 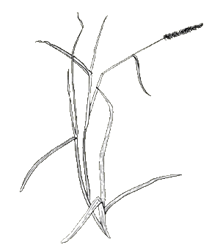 a slender, usually twisting, structure found on the stems or leaves of some plants that aids climbing by clinging to objects and thereby providing support (See an image of a tendril). a perianth segment; a segment of a flower that has petals and sepals that are almost indistinguishable. 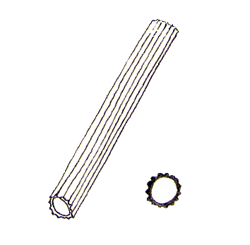 cylindrical (i.e. circular in cross-section) and tapering at the ends. growing or present at the end of a plant structure (e.g. branch, stalk, leaf, fruit, etc.). 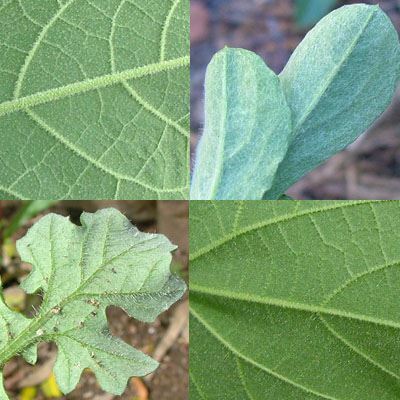 occurring in threes; describing a leaf with three leaflets; trifoliate. living or growing on land (i.e. not in an aquatic environment). a sharp pointed outgrowth on a stem or leaf; a large prickle. having thorns; resembling a thorn. a dense panicle-like flower cluster (i.e. inflorescence) in which the side branches end in cymes. an upright shoot originating from the base of a plant (commonly found in the grass plant family (i.e. Poaceae)). densely covered with short matted hairs; densely covered with matted woolly hairs. poisonous (i.e. capable of causing injury or death). almost transparent or see-through (i.e. allowing light to pass through); semi-transparent. running in the direction of the width; situated or lying across; crosswise. a woody perennial plant of considerable size when fully grown and usually with a single main trunk in evidence. having three angles or three sides in cross-section; three-sided (See an image of a triangular stem). 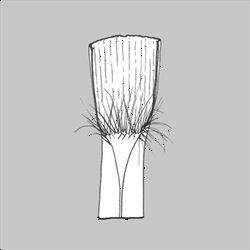 a small stiff hair-like or bristle-like structure; a hair found on a stem or leaf surface. 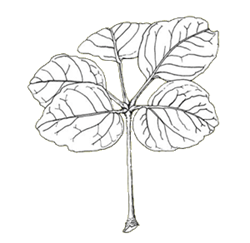 describing a compound leaf with three leaflets (See the Trifoliate Leaves information page). three-angled or three-sided; triangular in cross-section. three-angled or three-sided, but with the sides being incurved or concave and the edges protruding. a climate characterized by hot temperatures and high humidity; the climatic zone either side of the equator. appearing to abruptly terminate as if cut off squarely at the tip or base. a swollen underground stem that functions as a food storage organ or as a means of vegetative reproduction; a projection or swelling on a stem. hairs that have a swollen or wart-like base. having tubercules; with small wart-like swellings or small rounded outgrowths. a small tuber-like swelling; a small wart-like projection. resembling a tuber; bearing or producing tubers. shaped like a tube or hollow cylinder. the leaves are densely clumped at or near the base of the plant (See the Tufted information page). 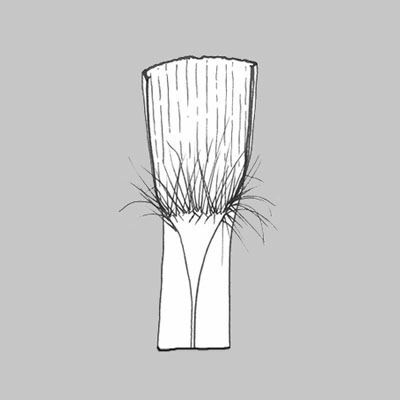 a clump or dense tuft (usually referring to the bunched stems of many grasses and sedges). a climbing plant that winds, twists or coils around objects or plants for support. twisting or coiling around an object or plant. a flower cluster (i.e. inflorescence) in which several individual flower stalks (i.e. pedicels) arise from the same point at the top of a flowering stem (i.e. peduncle). 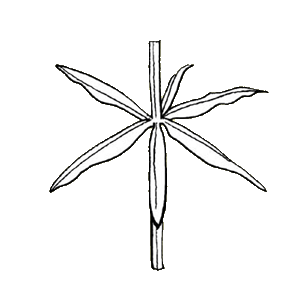 arranged in umbels; resembling an umbel. having a wavy appearance or outline. having either male or female reproductive organs, but not both; a flower with either male or female parts. a small, bladder-like, one-seeded, and indehiscent fruit. having different coloured markings (e.g. spots, blotches, streaks or patches). a taxonomic subdivision of a species, a group of individuals which is distinct in form or function from other groups of individuals within a species. highly developed plants that have specialised structures or tissues for circulating fluids within the plant (i.e. vascular tissue). reproduction by non-sexual means, involving vegetative plant parts. velvety hairy; densely covered with short, soft, silky hairs. the arrangement of the leaf when young and its process of unfolding. warty; covered with warts or wart-like projections. with three or more leaves or other appendages arranged around a stem at each node; whorled. a climbing or creeping plant that is weak-stemmed and supported by other objects. 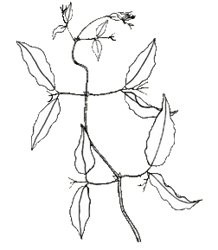 example diagram of a vine. a plant existing in a place and/or at a time in which it is considered undesirable or troublesome. having stems or branches which droop or hang down towards the ground. three or more leaves or other appendages arranged around a stem at the same level, usually at a node. a thin or membranous extension that is attached to one of a variety of plant structures (e.g. seed, fruit, stem); one of the two, usually smaller, lateral petals in a flower belonging to the pea plant family (i.e. Fabaceae). those weeds which have a degree of woodiness (i.e. usually shrubs or trees). having two sides that are the mirror image of each other; bilaterally symmetrical.